Anticipation is growing as Mazda announces both the launch edition and prices for the MX-5 Miata’s trim levels. The first models are expected to arrive late summer with regular shipments commencing by autumn. Mazda Motors may be one of the smaller car manufacturers with a presence in the US market, but it also has one of the most highly-anticipated models in the snazzy MX-5 Miata. The next generation of this delicious roadster will be arriving stateside this summer. Notably, production of the US-specification model has just begun with pricing on all trim levels also announced. Weeks after production of the Japanese-specification Mazda MX-5 Miata or “Miata” commenced, the left-hand drive version heading to US shores is now underway. To mark this auspicious occasion, Mazda has released its strategy for the diminutive two-seater. And that strategy involves sending 1,000 “launch edition” models to the United States first, representing specially-equipped models outfitted with Grand Touring trim, keyless entry, a Soul Red exterior and a Sport Tan interior. That represents an exclusory combination for this special model. Moreover, the Launch Edition will carry special badging and sport a manufacturer’s sticker price of $30,495 plus $820 for destination charge. Launch edition buyers will also be provided with a few gifts for making an early decision. Specifically, customers will receive a Mazda-branded BOSE® SoundLink® Mini Bluetooth® speaker delivered in a custom-made gift box, in addition to exclusive items curated from Mazda’s forthcoming “Heritage Collection” apparel line. As a result of the launch edition’s announcement, Mazda has also enumerated the cost for each of its prevailing trim levels. Namely, those trim levels are: Sport, Club and Grand Touring. 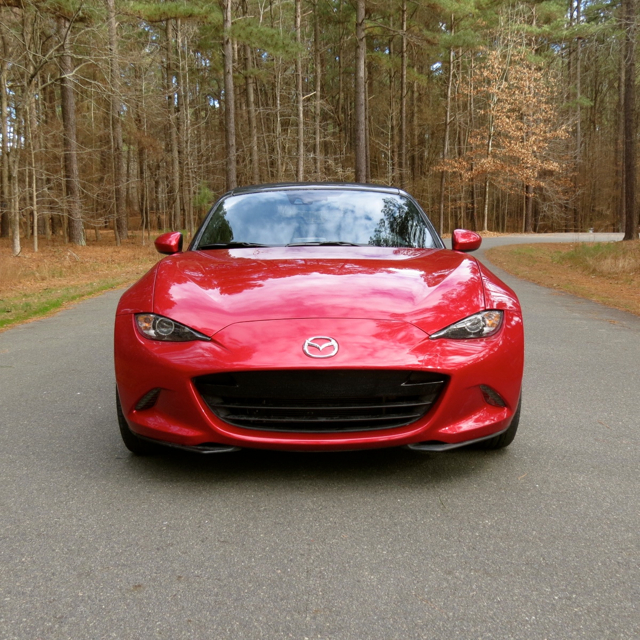 To begin, the Miata Sport will be priced from $24,915. This model will be outfitted with 16-inch alloy wheels and provide a cumulation of new customary features, including a six-speed SKYACTIV-MT manual transmission, cruise control, LED headlights and tail lights. Furthermore, this edition will offer Bluetooth phone pairing and audio streaming, a leather-wrapped shift knob, power door locks, a USB input as well as cruise control. For the Miata Club edition, buyers will pay from $28,600 and receive upgrades such as 17-inch gunmetal alloy wheels, exterior embellishments — including a front air dam and rear spoiler, a 7-inch color display for the infotainment system, and a 9-speaker BOSE audio system with headrest speakers. For buyers who opt for the 6-speed manual transmission, a limited-slip rear differential, Bilstein shocks and a shock tower brace are included. Choose the Grand Touring edition ($30,065) and your Miata comes outfitted with 17-inch bright alloy wheels, heated leather-trimmed seats, the 9-speaker Bose audio system, automatic climate control, adaptive headlamps, and various safety features. Indeed, those safety add ons bring in blind spot monitoring, rear cross traffic alert, and lane departure warning. The Miata may be on its way to the USA, but those early orders cannot be placed until May 5, 2015. In addition, the first batch of vehicles are not expected to arrive until late summer, which means that an August 2015 premier date seems likely. In addition, people who don’t get in early will most likely not see their 2016 editions until the fourth quarter or later if demand is strong. If you want to get in on the launch edition, Mazda has set up a special website for ordering at LongLivetheRoadster.com. Expect that the Launch edition will sell out the very same day it becomes available.